Makeup fused with skin care is one of the biggest trends season. In fact, more than 8 out of 10 women say that they use makeup with skin caring benefits or benefits that are going to help them in taking care of their skin. In addition to that, 61% of women surveyed said that they use makeup products with benefits that are similar to the ones contained in their skin care products. Now when I put these statistics before women of color, it pretty much held true to the same statistics. And the reason that they gave was that when you buy a cosmetic/makeup that has properties that are going to help you in caring for your beautiful black skin, it cuts down on the amount of products you will have to buy. Even if it cost a bit more, they're looking at the fact that they only have to buy one product, so overall the cost will be good for them. 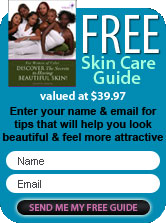 What are two factors that are important in skin care for African American Women? Regardless of age, moisturizing and sun protection were two of the most sought after benefits in all makeup products and the initial survey was done my NPD Group, which is out of Port Washington, NY. Makeup products with skin care benefits create the perception that you're getting more bang for your buck and with the group of African American women that I spoke with, that's what they liked about the whole concept of products having skin care benefits in it. Something as simple as a lipstick that may contain pomegranate, which will hydrate and moisturize their lips as they apply it, was a positive thing. This was one of the things they were looking for or moisturizers with sun protections already in them. They're getting one product with the benefit of a moisturizing product with an SPF that's going to help them when they walk out into the sun. Now one of the biggest beauty trends of the year was in nail color. Not everyone wears nail color, but if you take a look at the colors that you find in simple nail polish, you will see that the vibrancy and boldness are the same type of colors that you're finding in eye shadows and lipsticks. One of the key things to remember, as far as the season is concerned, is don�t be afraid to express your boldness. You don't have to look like a clown, but at the same time, when you're dashing out to a party, parties give you more of an environment where you can express who you are. If you've been waiting to try that new plum eye shadow color that you really liked on the shelf, a good party or night at the club would be an environment in which you could really have that expression. If you want that bold berry lip to go with it, it's great way to express your uniqueness. At the same time, you can express your uniqueness in your lip color for the office, but not so much with the over the top shadow of burgundy and silver. Maybe it's just burgundy or bronze but those are just ideas in terms of color and the rich tones you'll find in the lines of cosmetics that are open for the season. With the beauty of your bronzed skin, there's a certain essence that as African American women, you have and you don't always have to play up everything at once. But you have the opportunity to be expressive in, not only your clothing, but also now the boldness of colors in shadows and lip-gloss gives you that same opportunity. There's Beauty in your blackness, roll with it!